It had been three years since I did my Basic Mountaineering Course from ABVIMAS, Manali and a desire to enrol for an advanced course had been breeding inside me since then. 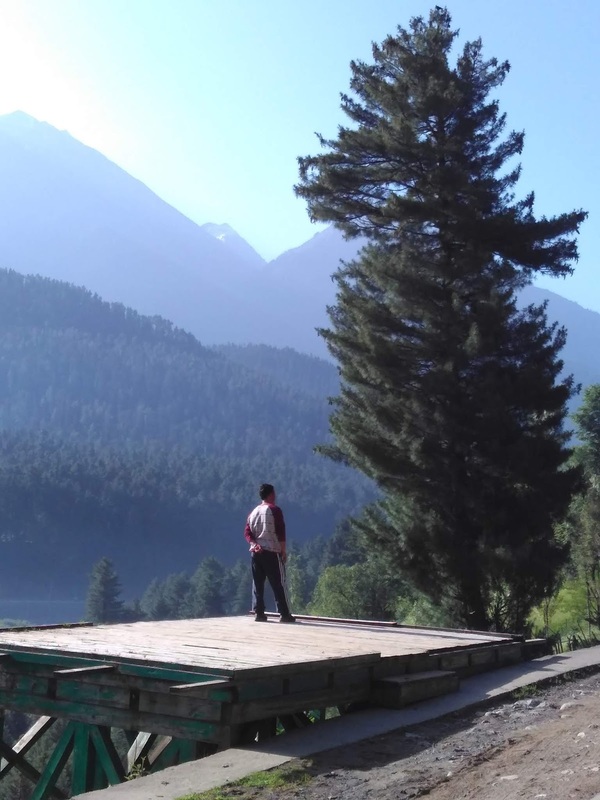 But the busy work life never understood my desire and I felt that I am forgetting all the basics I had learnt in Manali. 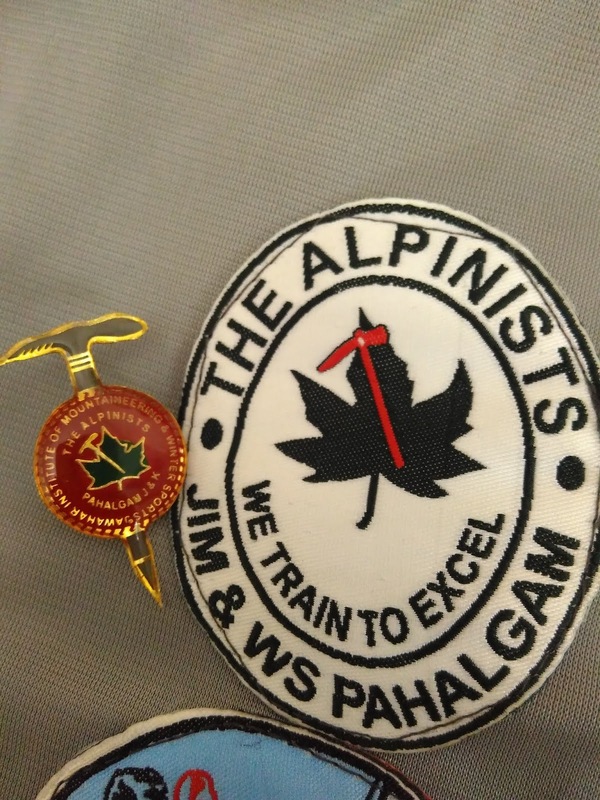 It was then I enrolled for the advanced course at JIM& WS (Jawahar Institute of Mountaineering & Winter Sports) and began practising all the basics I had learnt in Manali three years back. 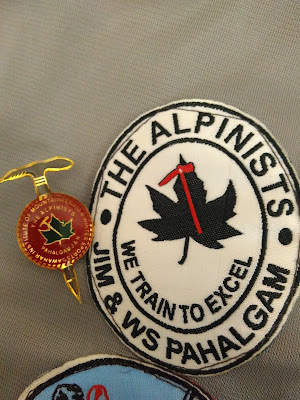 I had chosen JIM & WS as my training school because I had a belief that their instructors are trained in prestigious military-run institutes for high altitude warfare and they could impart some technical skills to us and the second point was that their batch size remains smaller (though the latter didn’t happen). Then began my month long journey into another phase of professional mountaineering which would make me eligible to be part of expeditions in the Himalayas and keep my adrenaline on the all-time high. 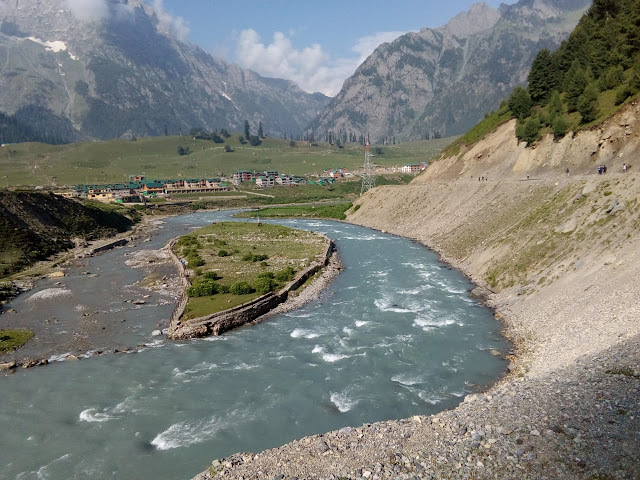 Day 0 (30th June 2018): In heavy rains, I and a friend from Pune reached the headquarters at Pahalgam and the first thing even before informal introduction with few guys around we could do was get into our sleeping bags. 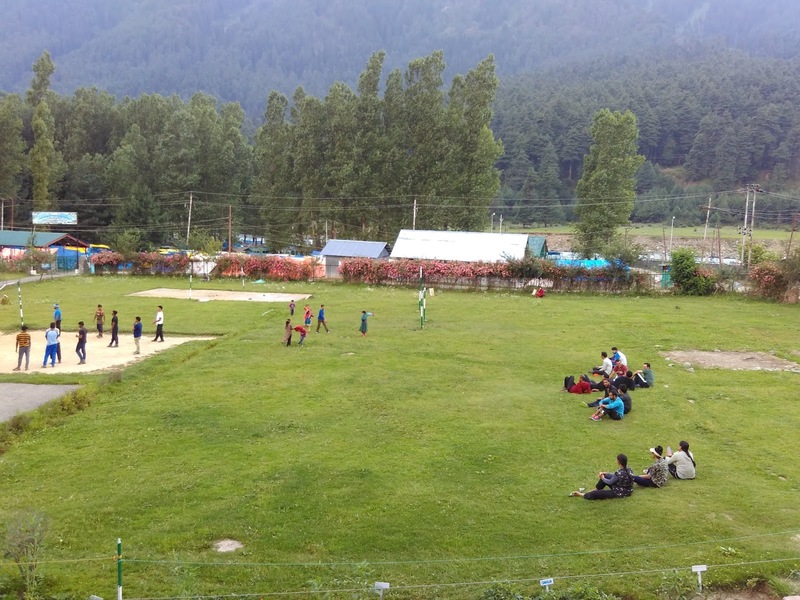 In no mood to step outside the hostel and feel the chill, we preferred to take some rest. It was later in the evening I met the guy sleeping on the lower portion of the bunk bed while I was on the upper one. The dorm was huge accommodating about 40 students. In evening we had our first Fall in where our senior instructor (Ustaad) briefed and welcomed us. 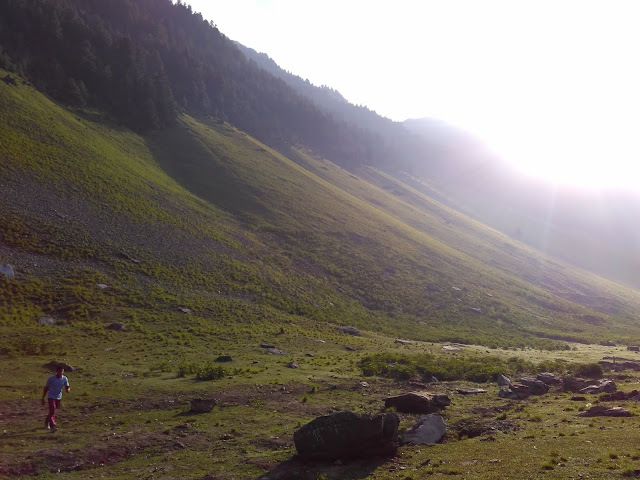 Day 1(1st July 2018): We went for an acclimatization walk early morning behind the institute at Ganeshbal village. Slippery grassy slopes had made the climb difficult. But the view from the top was breathtaking only before we could realize that we had to descend the same slippery slope which was not my cup of tea, at least on day 1. But as the ustaad says, ‘ Advance hai, Doubt to hona hi nahi chahiye’ (In the advance course you should not have any doubts). Day 2: Sharp 7 AM our endurance run practice begin. 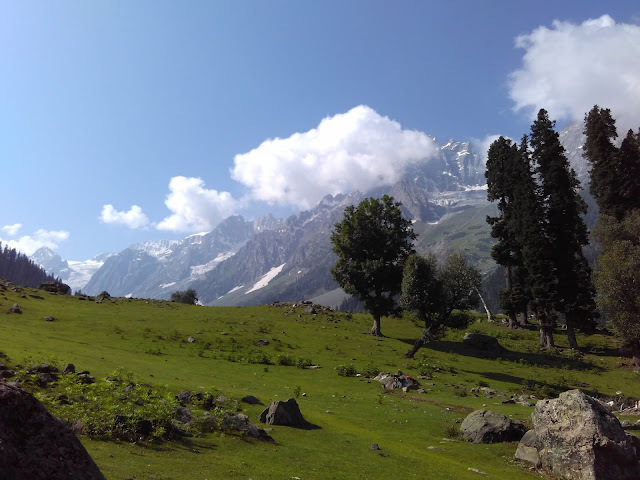 Some call it P.T while some call it acclimatization run and others call it endurance. But that hardly matters because in any case, we got to run while no one wanted to (except few running freaks). We wanted it to rain and weather Gods had other plans. 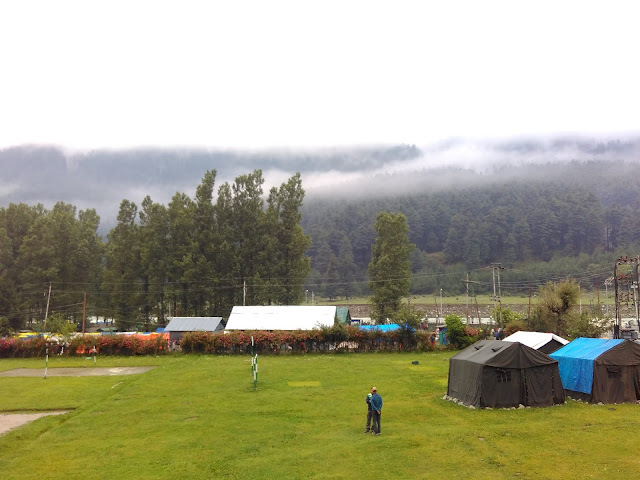 It never rained during P.T hours though every single cloud poured during the activity time. Such a bad luck early morning (though it proved beneficial during later stages of the course). At 10 AM was our knots class and we revised all the knots we had learnt in the basic course and learnt few advanced special knots. (Draw hitch, Disk Hitch, and some unsafe knots like Jury Hitch which is not a pre-equalised anchor so that we also know what not to do in mountains). Practising knots with a sling is always fun and we all had been allotted a rope sling for the same. For me, it’s a better time pass than solving a Rubik's cube. 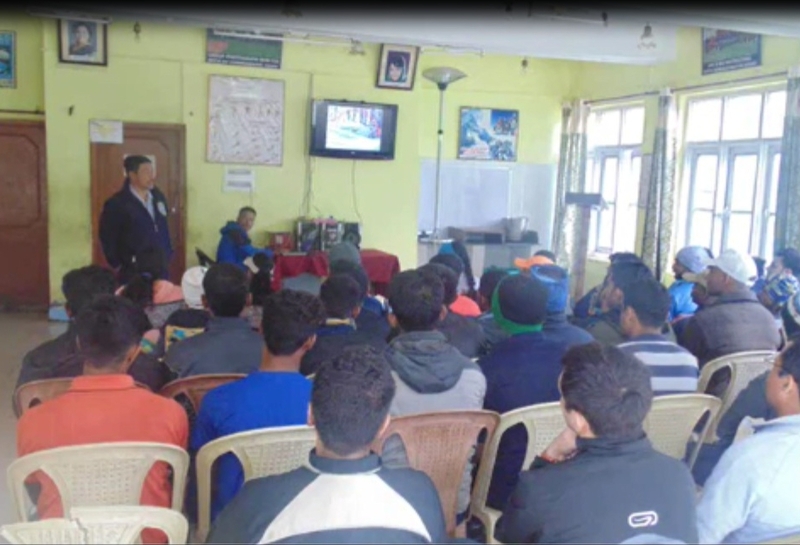 In afternoon was our first lecture on ‘Acclimatization schedule and Do’s and Don’ts in Mountains’. Lectures were interesting with lots of practical examples. The evening after the lecture was time for a volleyball match but I had other plans. While trying to hop into my sleeping bag again I overheard a conversation on some expedition and then I couldn’t resist becoming part of such discussion. 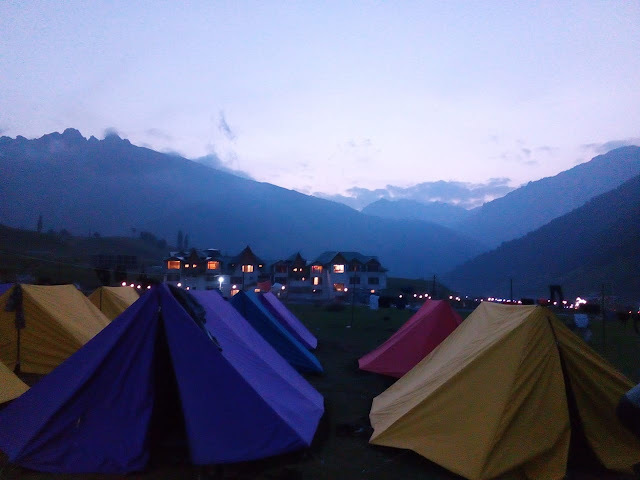 Afterall I need someone to discuss mountains and then began my interactions with climbers of the advanced course. Rest of the day went in deep discussions and clicking a few photographs. Day 3: Distance of Endurance run increased while my speed was decreasing with every increasing kilometre. I wanted to ride a cycle while my ustaad wanted me to run fast. Somehow I managed to finish the circuit and reach back the institute to cherish the breakfast delicacies. The day was meant for rescue activities. We were taken to a park where we could see a lot of natural rock faces. 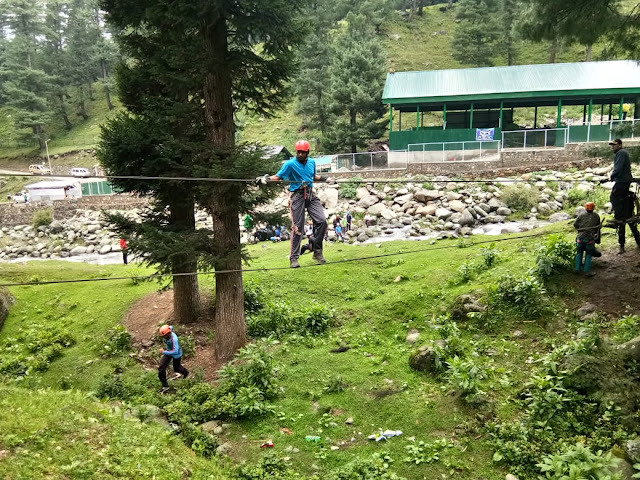 Teams were split and our team was given the time to practise Alpine Basket (a casualty stretcher made using rope and carry mat) while other team got busy preparing a zip line setup for descending the casualty. 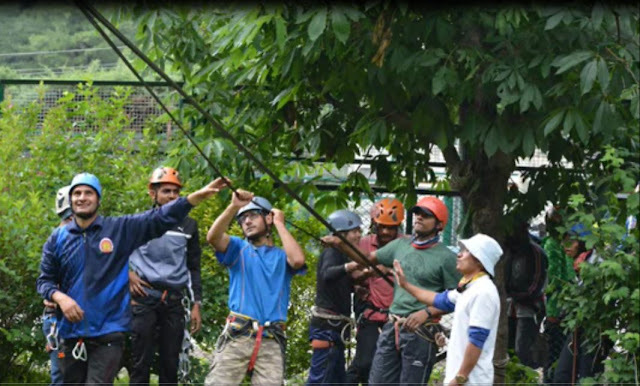 Finally, the technical part of the advance course had begun and so the increase in my adrenaline levels which could be seen later when I descended from a zip line with a wide smile on my face. lekin thi chadaai is baar Kohlai. 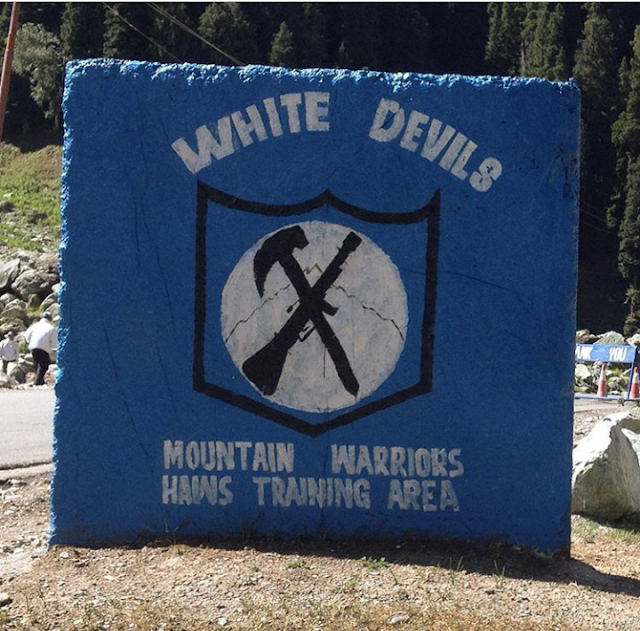 Lets read ahead to know what glacier we actually went to train. Today was another lecture on Mountain Terminology which also forms an important subject of discussion. Our instructors had nice practical examples to make us understand the tough concepts with ease. Evenings were the same. 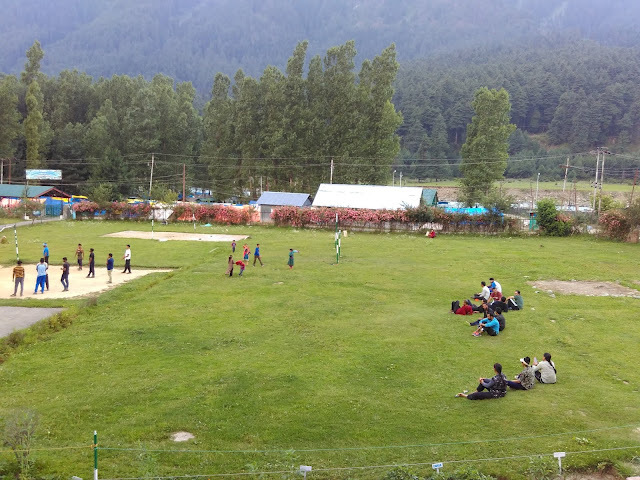 30 students in volleyball court, 5 sleeping, 5 washing clothes or maybe themselves (I refrain from both when it is too cold), 10 discussing the mountains, 5 clicking selfies and 7 which includes me, wandering and trying to explore something (sometimes in the grass and sometimes through a camera). Though later we were sent to market for an hour to purchase necessities and luckily I came back on time and didn’t have to go through the pushups punishment. Day 4: Today footsteps of our rope members marched in rhythm as we were running in morning P.T. The motto was to leave no one behind. It was fun running in rhythm as we didn’t realize how fast we had covered the distance. 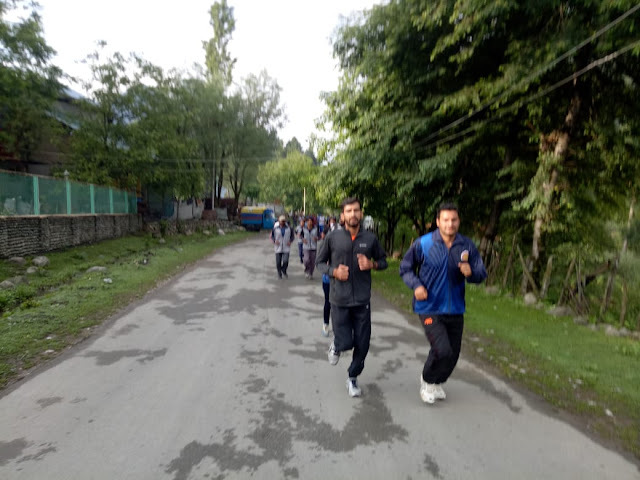 My speed and timing were improving by now and it felt good to run early morning unlike day one. The day was meant for stream crossing and we were taken to a nearby stream where icy cold water was flowing. 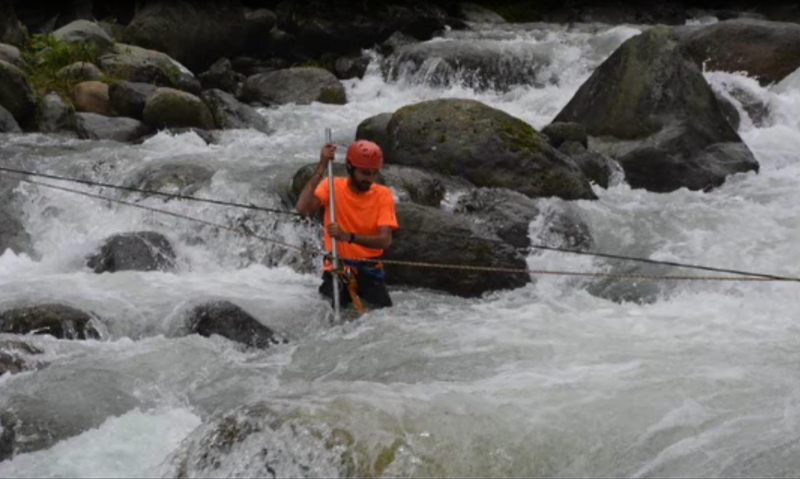 We were given an aluminium pole to help us cross the river with ease but our ustaads were in the adventurous mood and they used to tighten the belay as we reached the middle of the stream. And in some cases like mine, the belayer behind me was also instructed to tighten the belay at the same time. The outcome was simple, I was floating in a stream and my so my pole due to which I couldn’t make a strong foothold and my belayers were enjoying the scene. Though soon I was pulled by my instructor. It was a nice swimming session. At the same time, we were also taught how to make a rope bridge. and later we practised traversing it while our instructor had fun while he shook the bridge and we had a fall. It rained in the afternoon and we attended another lecture on ‘Mountain Hazards’ which was itself a hazard between me and my sleep. But soon the ustaad understood as he looked into my sleepy eyes and more practical examples were added to keep my eyes wide open. When instructor is in adventurous mood, he can shake the bridge. Day 5: By the time Amarnath pilgrims had started thinking that we are preparing for a marathon but who knew their thoughts might come true on our summit day after 15 days. Today was endurance surprise test which anyways surprised most of us. Till now those who used to run slow looked nothing less than Usain Bolt and I was the most surprised person who had been acting honestly till now. So I finished in the last ten. But I believe that endurance is a competition with our own self and not with someone else and my speed was improving day by day and I felt happy about that. Today we were supposed to practise Rappelling on an overhang rock face but weather Gods didn’t want us to so we had to remove the whole setup, coil back all the 100-metre ropes in rain and return back to the institute. Thankfully the institute bus came to rescue the climbers of advance course who were drenched in heavy rain. 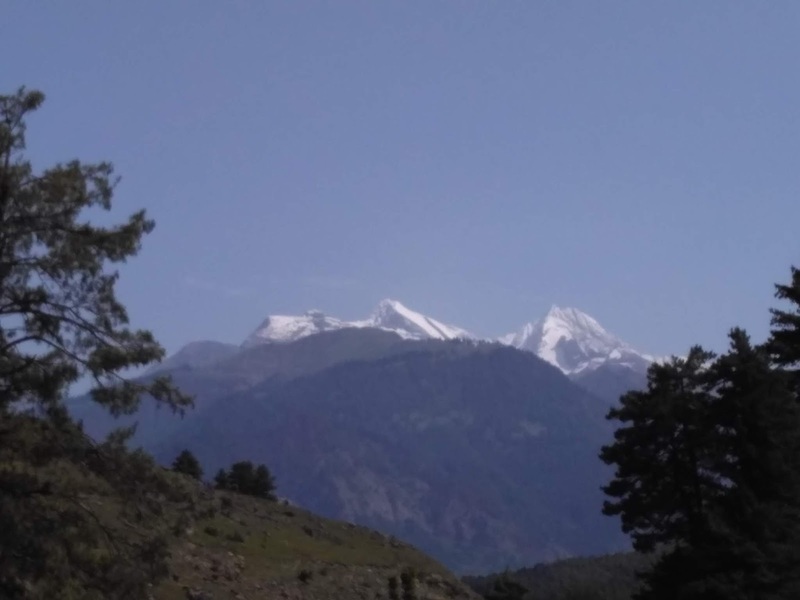 It was a movie day and we watched a documentary of Indian army women team summiting Everest followed by Lunch and then we had another lecture on Avalanche. Thankfully I didn’t sleep in class today. 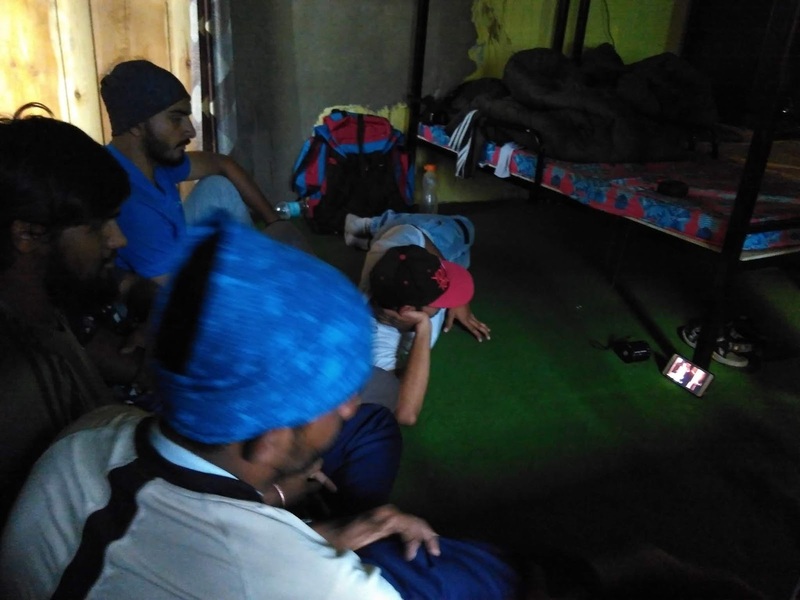 Later in evening few of us had built a ‘Jugaad’ cinema for us while one of our friends had surprised us by downloading the latest Bollywood thriller ‘Sanju’ on a 4G network in a place where we struggled to get a good 2G network. So then began our show in ‘The Great JIM Cinema’ where the mobile phone was our Big Screen while a Bluetooth speaker added special sound effects. Day 6: Thankfully today we were relieved of P.T, But did I say we were relieved at all? It was an acclimatization walk up to Mamal Temple which is a beautiful temple built using stones dedicated to Lord Shiva. 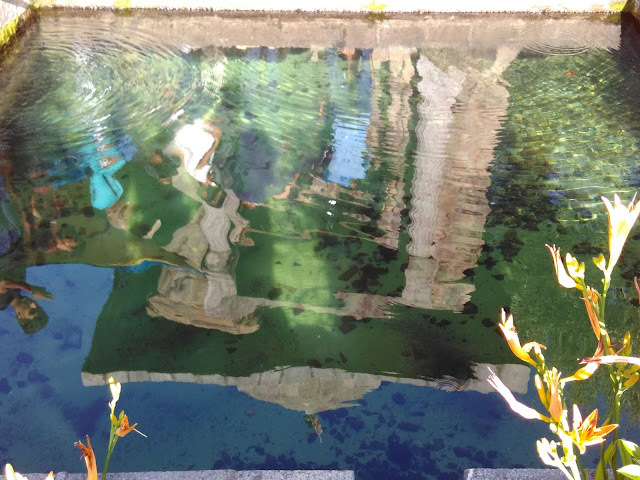 If the morning exercise was light, one should expect something challenging in afternoon activity and my expectation turned to reality when we had to practise double jumaring. 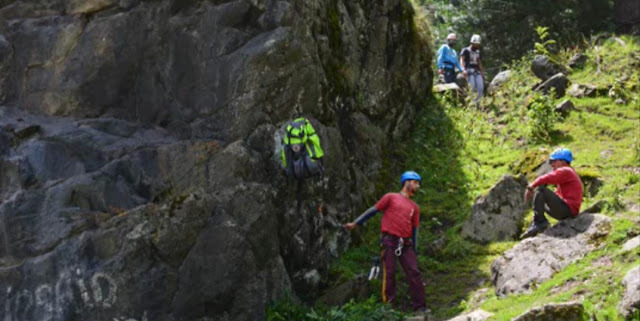 It is an activity where a climber ascends the rope using mechanical ascenders and here we were ascending an overhang rock face. 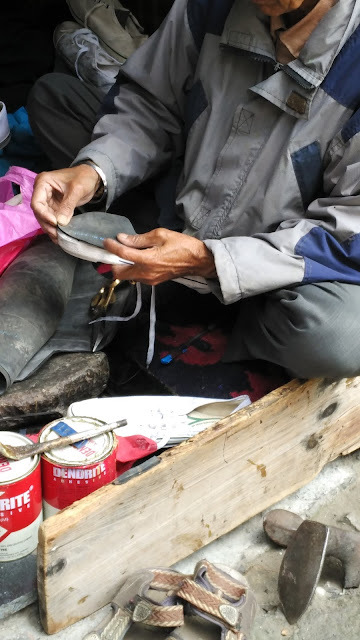 The technique is fairly simple but doing it too fast or without proper measurement of jumar height, one can get exhausted easily. 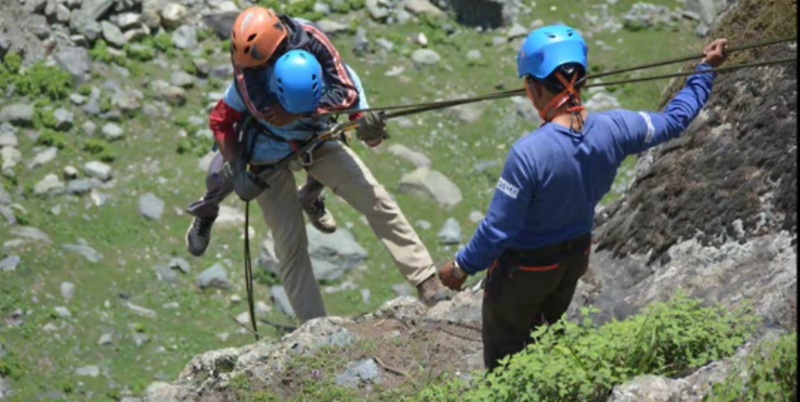 A rappelling line had also been set up to compensate previous day’s activity. Rappelling an overhang is fun and your proficiency is judged on basis of how many times you hop on while coming down. 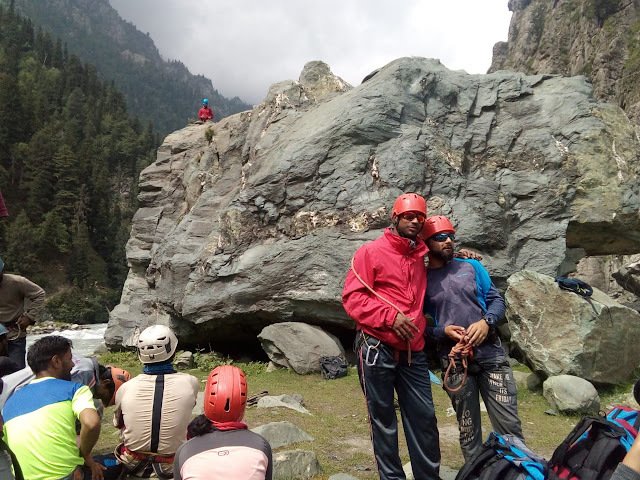 Rest of the time was spent belaying others and clicking photographs. Day 7: Endurance runs resume and I was performing better than before. After all, it had been a week since we started to run. 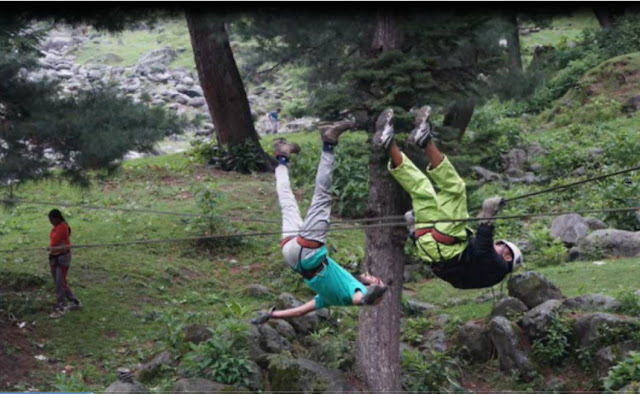 Today we again went for double jumaring and rappelling as everyone could not get a chance to perform the previous day. I along with two other friends went further on higher rocks to practise various anchors using rock pitons and we began experimenting with equalised and pre equalised anchor to enhance our skills. That is the beauty of mountaineering schools, you can see serious and ambitious climbers around and learn a lot from them. 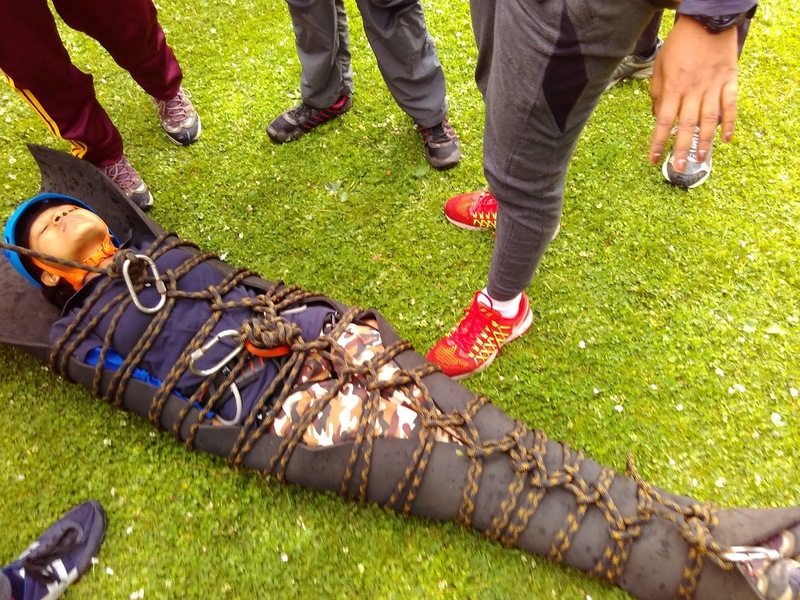 Then we were taught the use of Klemheist Knot (Machard hitch) which is used to ascend the luggage. 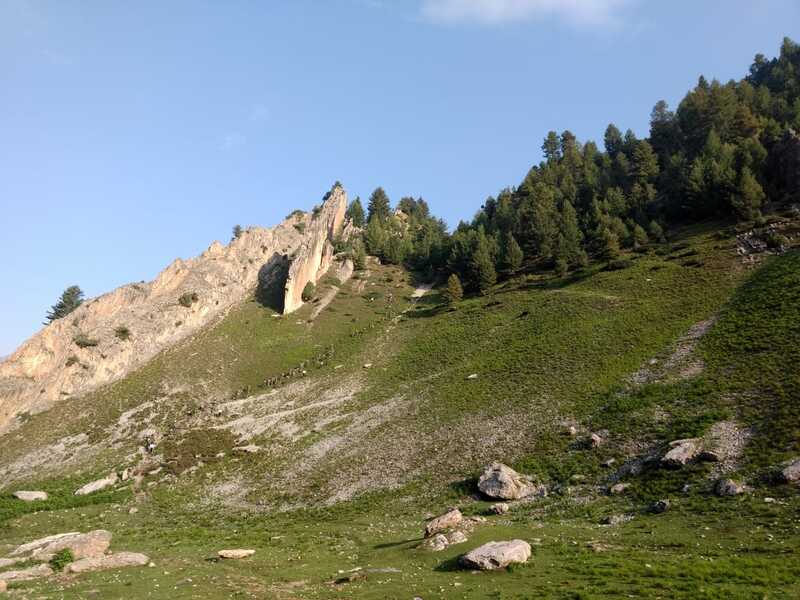 Later in evening we had another lecture on ‘Glaciers’ which went too deep and practical until someone interrupted our instructor to ask a question- ‘What is a ridge line?’ and I began wondering where was this silent masterpiece all this week who is doing advance and yet to identify a ridgeline. But guiding our teammates is our duty and we should never fail in sharing the knowledge. 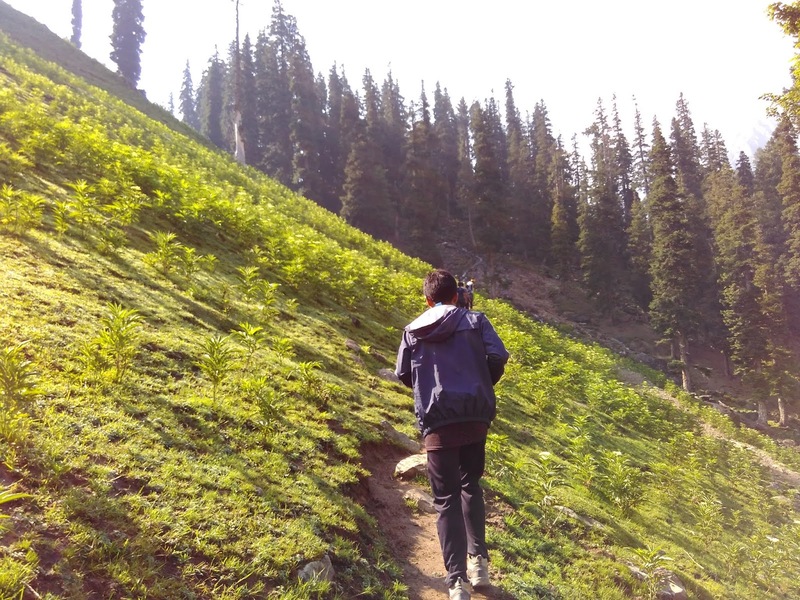 Later each of us was allotted a peak on which we had to plan an expedition and mine was Mt. Lhotse (Nepal). 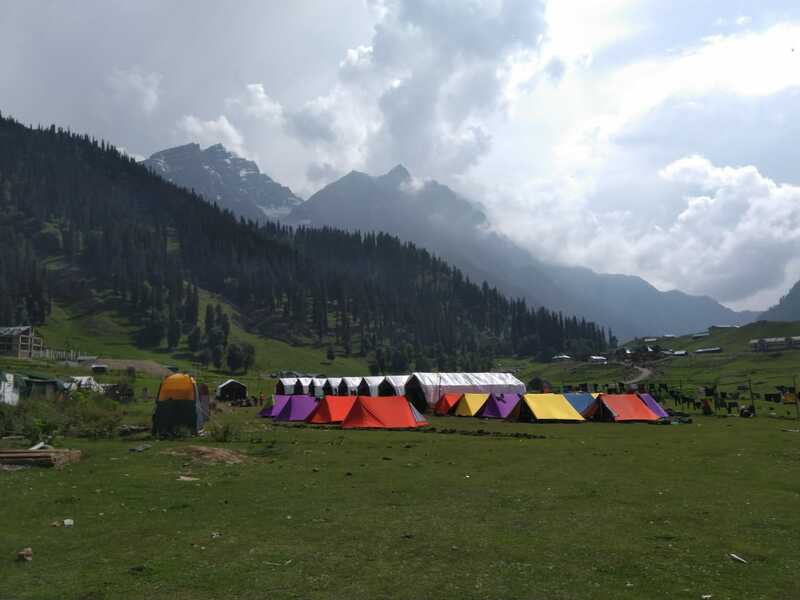 We were also informed that we would be moving to sonamarg on the 9th day and the 8th day would be Adam’s day (a free day) to prepare and pack our stuff. Later from Sonamarg after completing our rock craft we would be moving to mochai glacier. Plans to move to Kohlai glacier and Aru valley was cancelled due to heavy rains in that area. Ustaad in a thoughtful mood. Must be planning something scary for students. Day 8: Adam’s day doesn’t mean there would be no P.T. It only means no climbing activity and no lectures. 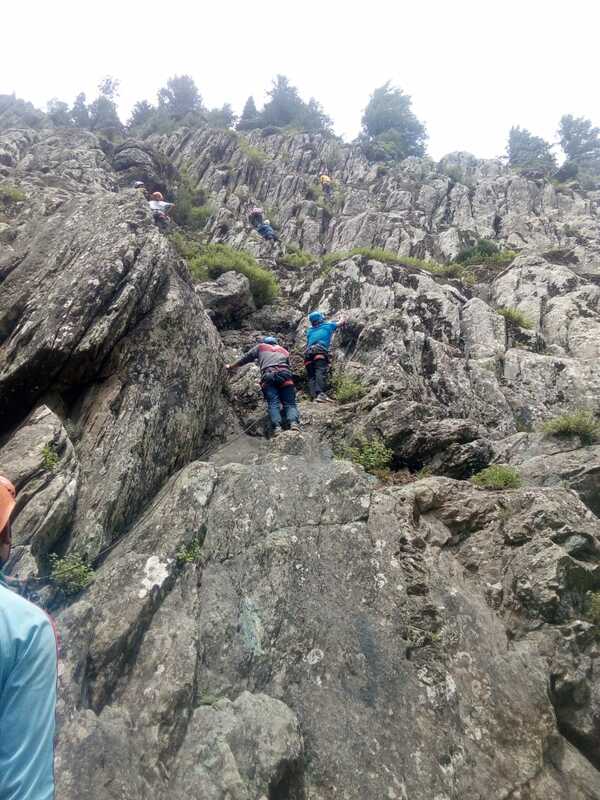 Life goes on like this in mountaineering institutes. The day was spent packing, washing (I had to do this task today despite cold weather) and loading the jeeps with ration and other camping equipment. Still, I did not miss a chance to take a short nap or reading Tarun Goel’s new book (Sabse Uncha Pahaad) whenever I got time. 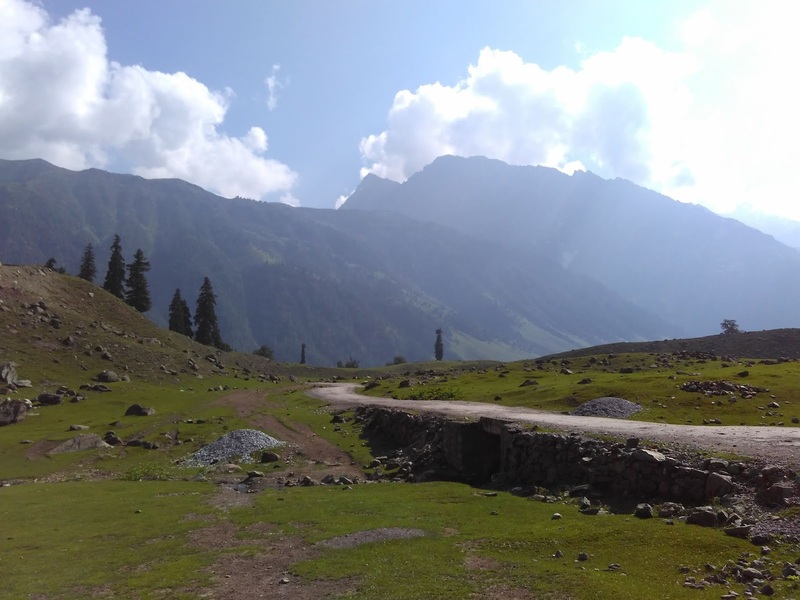 It was our last day in Pahalgam. Day 9: We had planned to move by 7.30 AM but thanks to our mess workers who woke up an hour late and we moved after 8.30 AM after having our breakfast. Our mess workers must have been working late night in packing the kitchen equipment and preparing for base camp. 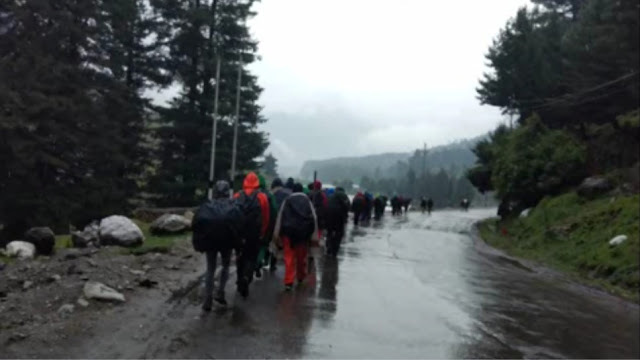 All 62 students and four instructors seated in buses we made our move to another paradise on Earth and jewel of Kashmir, Sonamarg. 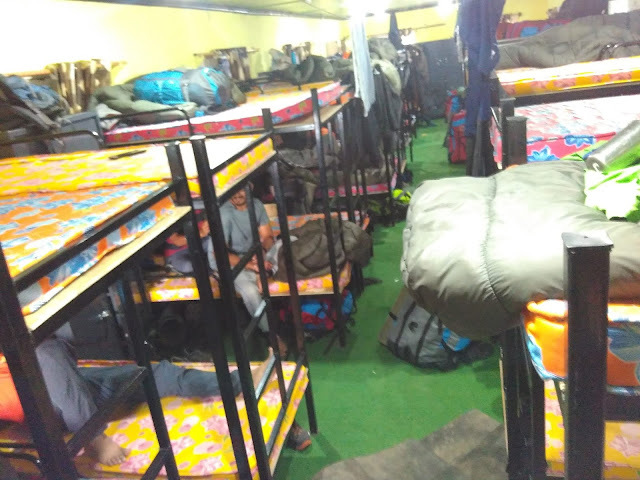 Our camp, unlike previous batches, was located in the town in a military transit depot from where ration for defence units located in Ladakh is loaded into another vehicle. 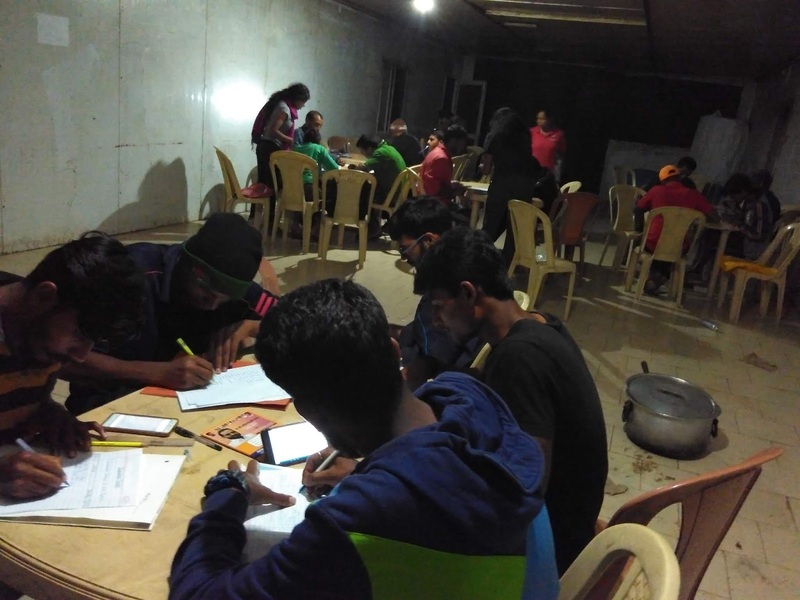 Even a batch of Basic course was being conducted here which surprised them when 132 students had to use a common tap for washing the utensils after meals. 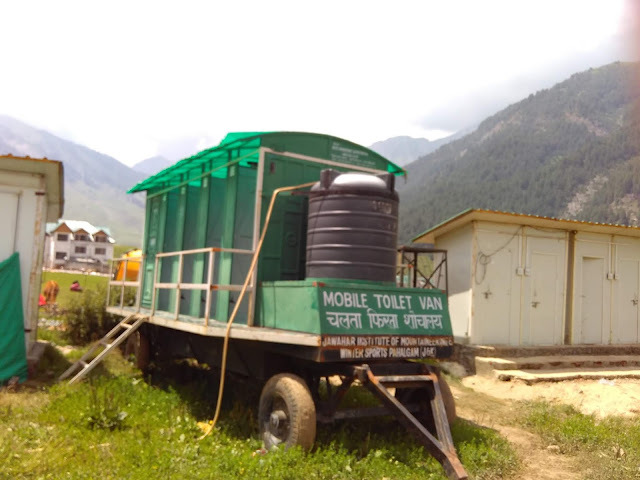 I could sense that early morning clearing up job would become difficult if I didn’t get up on time so I usually woke up between 4.30 to 5 AM to occupy one of 10 toilets allotted to us and would still find few like-minded people who had woken before me. 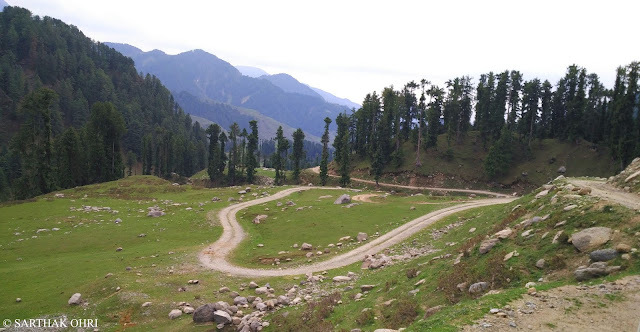 Such is life in the mountains. The day was spent setting up the camp and unloading all the bulky ration, gas cylinders and equipment we had loaded a day before. 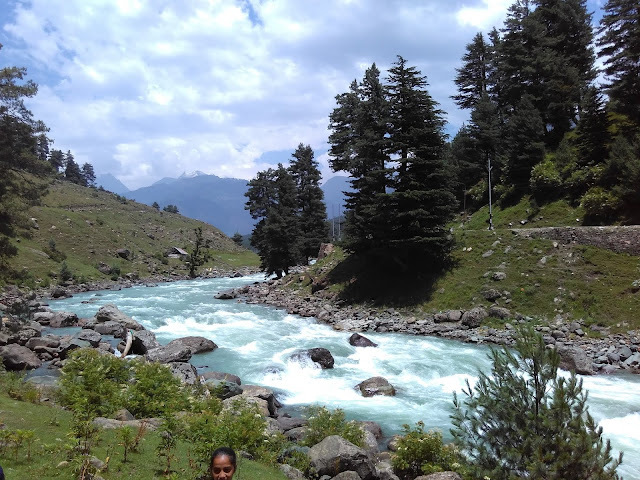 Day 10: Our PT resumes and this time the altitude is more than Pahalgam. We were taken to a hill where the cadets of HAWS were being trained. They ran more than 20 kilometres every day with 30 kgs of load on their back which includes their arms and ammunition too. We were nothing in front of them. Soon we trekked on their route which is called Sindhi pass and we were huffing and puffing after a few minutes walk on that steep slope. HAWS rock training area was far from our camp so the first day we had the privilege of travelling by institute bus. 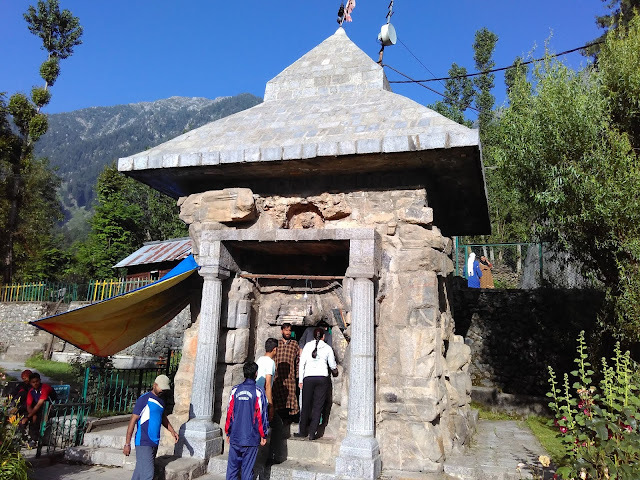 Before beginning our training we offered prayers for safe training at a temple made at training area. The day was spent there observing their training demos and practising casualty rescue (Cliff rescue, Mountain rescue). Though we could only practise being a casualty. 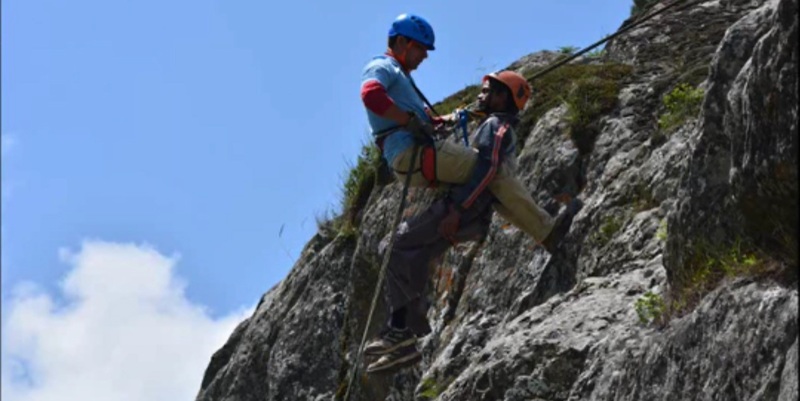 Our instructors didn’t want to take the risk of putting a casualty on our back as the rock face where we had to rappel was too steep and even a single slip meant fatal consequences for both the rescuer and casualty. 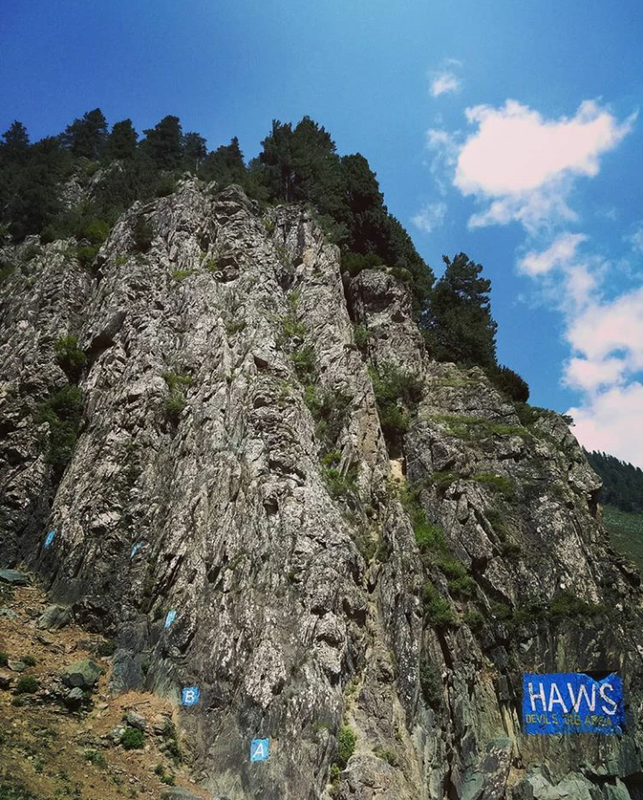 Training area of HAWS is spread wide which consists of huge rock cliffs. They have prepared multiple climbing routes where one can train for almost every possible technique of rock climbing at any level of difficulty. Seeing them trained and training around them was a privilege. Later in evening, we had a lecture on ‘Shelter’. Rest of the time went by admiring the beauty of sonamarg and watching Thajiwas glacier hanging high on a rocky cliff with my Binoculars. It was then our instructors reminded us that we had to prepare an expedition report on the peak which had been allotted to us. So students who hadn’t studied all their life had to wake up late at night to finish their reports before the deadline. Day 11: Endurance route changed and so the difficulty level. Our load carrying training had begun. 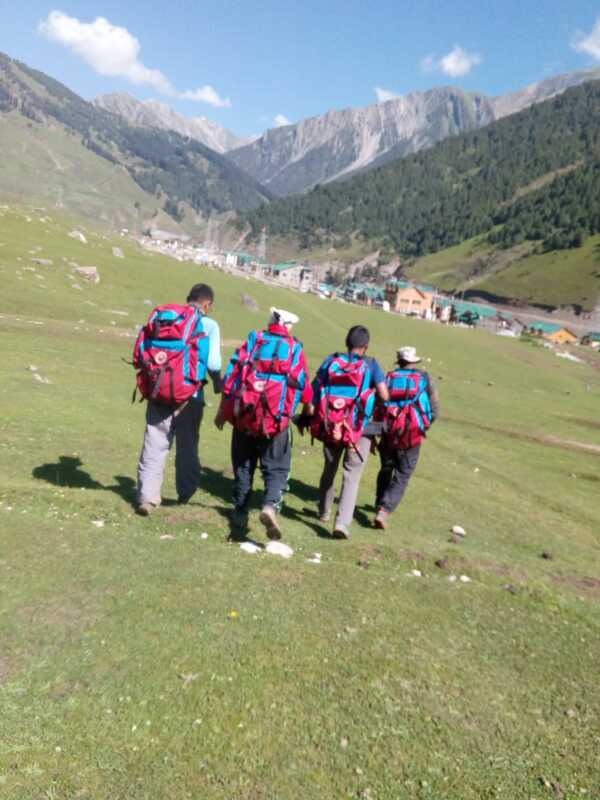 We were supposed to carry 12 kg load from today during our endurance runs which ultimately got renamed to endurance walk seeing our situation. 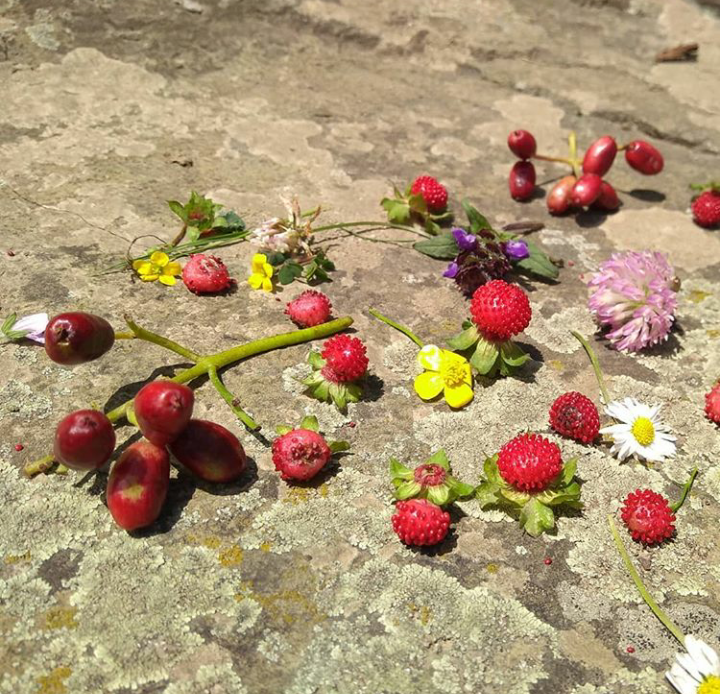 For latecomers like me mornings were always difficult to handle from returning late from endurance walk and then having breakfast within 10 minutes and packing the bag for rock activity and by that time course senior would blow the whistle for activity fall in. 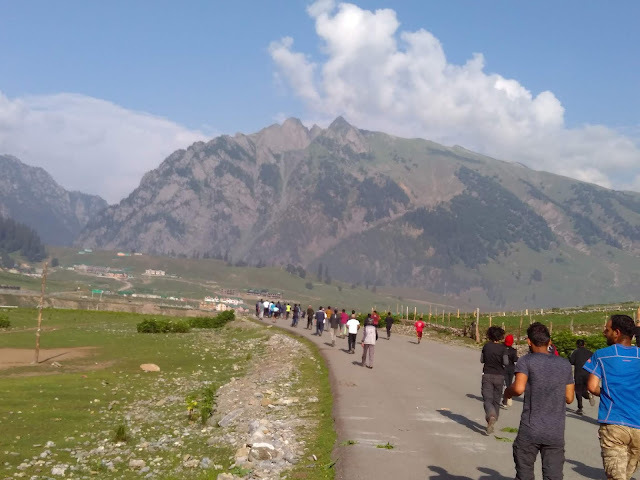 Today we had to walk all the way up to HAWS Traning area. Walking, running, walking and then climbing and then again walking back to camp and the half day got over. What a perfect routine to reduce weight. today we practised pitch climbing. It is a form of climbing where a team of climbers (8 members in our case) climbs a high rock face. While first climber (lead) climbs up to a certain point and then calls the second one who in turn calls and belays the third climber after the first climber has reached another higher point and set up a belay station. So the distance between two such belay points where climbers belay the next one is called a pitch. 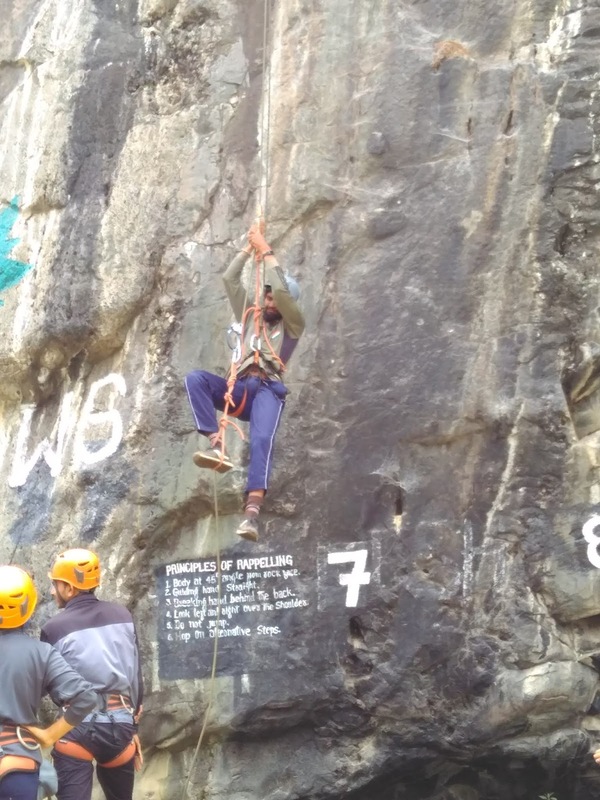 It was a great experience while we belayed our team to the top. It builds more trust and enhances our confidence. 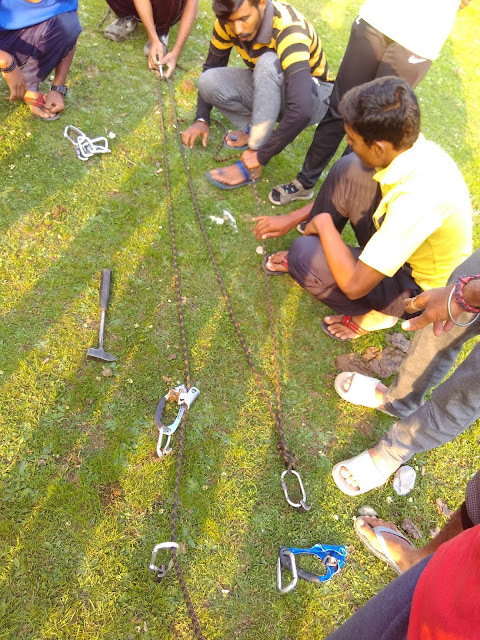 The usual scene after the post activity fall in was missing equipment which usually happened to be one or two carabiners. Someone must have forgotten to unhook his carabiner from his harness which caused trouble for all. 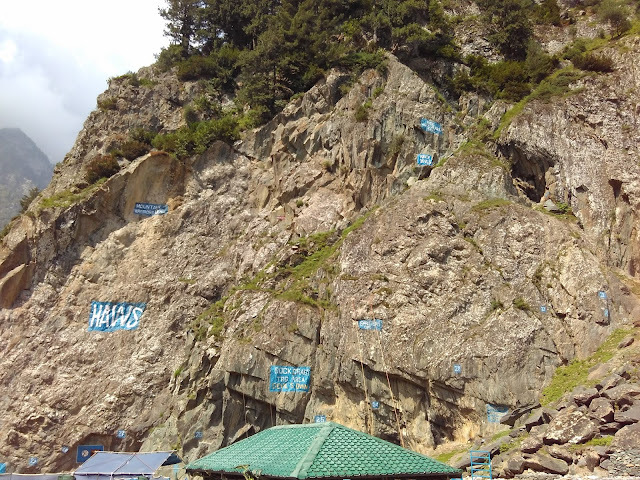 Until all the carabiners were deposited and a correct count was established within a fixed time we had to do pushups on rocks or run up to a particular boulder. Then except first fifteen again everyone had to run and the process continued until last fifteen zombies (who ran out of breath) were identified. Such punishments were our routine and we somehow loved them and I still miss them. In evening after a lecture on Map Reading, we were allotted our Ice Craft equipment. The equipment issued was new and of very great quality. Rest of the evening was spent playing ludo on a friends phone and making some memories. Day 12: Today the weight of our backpack increased to 14 kgs for endurance walk and so honest was our course that we never compromised with the weight. Rather few of us carried in excess of 14kg to increase their capacity. I somehow digest the fact and continue with my little 14 kg sack which is more than enough for me. By now we have been properly acclimatised at this altitude and the endurance runs don't seem to take a toll on us anymore. Today we went to practise bouldering. It was a huge boulder with a lot of overhanging routes and whenever the word ‘Overhang’ comes across me it goes over my head. For an average climber like me climbing whole overhang portion was somehow difficult but I tried my best as much as I could with an injury on the thumb of right feet which made it difficult to make footholds. But climbing an overhang is a great learning experience and requires a lot of efforts. The pressure was building on us to complete our expedition reports before we move to glacier camp but with poor internet coverage, we couldn’t get accurate data for proper planning. 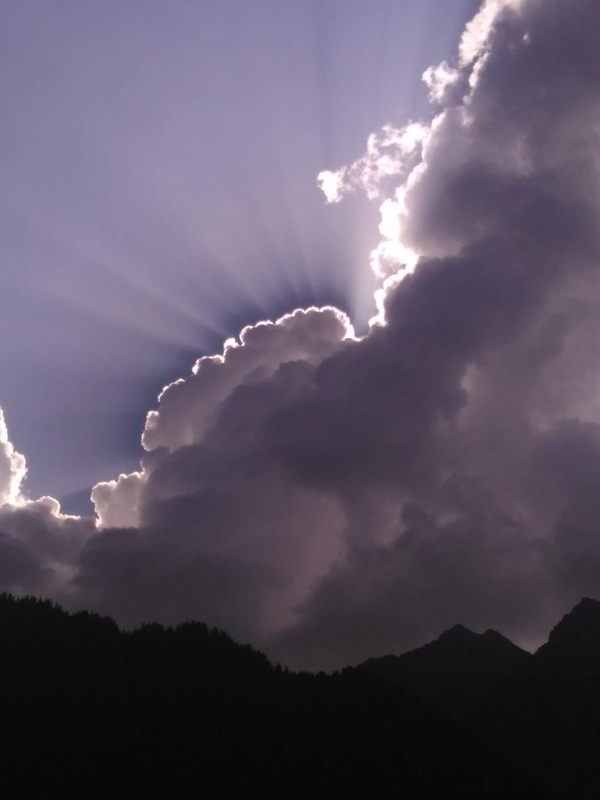 Somehow we managed in our 2G networks and finally submitted the file in evening fall in.